Appearing as a guest on Monday's Countdown show on MSNBC, the Huffington Post's Howard Fineman - also a political analyst with MSNBC - spoke favorably of the repeal of the Don't Ask, Don't Tell policy, asserting that "this historic vote will be remembered as a very important one in the social history of the United States," and, as he admitted that independent Senator Joseph Lieberman "takes a lot of guff on this network," gave the former Democrat-turned independent Senator "credit where credit is due" for supporting the measure. The dynamic of the next two years is going to be to re-litigate and reargue all the legislation that Obama and the Democrats for the most part passed in the first two years. That means efforts to defund, to delegitimize, to get rid of, you know, all the historic legislation that was passed these first two years, and spending is going to be the way to do it. ... So it's not that Obama's going to be running against the "do nothing Congress." The President is going to be running against the sort of "tear down Congress"because that's going to be the mode of the next two years. Fineman also notably used the term "progressive" - the preferred term of some liberals - instead of the word "liberal" as he referred to the left wing of the Democratic party, and contended that Republicans "went pedal to the metal on the fear strategy on immigration" as he explained why the Dream Act failed to pass the Senate. CHRIS HAYES: Let's start with the Don't Ask, Don't Tell repeal. It's a major civil rights accomplishment for both the departing Congress and the President, who spent the last two years fielding a lot of skepticism about his commitment to this. How do you think the White House is feeling about this? HOWARD FINEMAN: Well, I think they're very happy about it, and I think they're very relieved, in part because they got crosswise with their progressive base over the tax bill, for example. But here's a social issue where they really could be at one with the people who got them elected. And I would say beyond that that long after a lot of the details of other bills that were enacted this year and signed into law by the President or forgotten sort of just become part of the general statutes of the United States, this historic vote will be remembered as a very important one in the social history of the United States, and this a President who likes to make social history, as you know, and I think that's one of the reasons why he and his supporters are so proud of it. HAYES: You know, I'm looking at what's happened in this lame duck Congress, particularly if START does pass, which it is looking like it will - we'll get to that in a second - and I guess I'm trying to get my head around, how have they gotten so much done when there's been so much foot dragging, so much obstruction for such a long period of time, for the last two years? What is it about this lame duck? Is it the deadline they're up against that sort of forced a kind of action on this body that has been so sclerotic? FINEMAN: -he really worked hard on Don't Ask, Don't Tell. And I think also sort of the accident, if you will, or the President's decision to play on Republican turf on the tax bill, which is, after all, what he did. That created, however temporarily, sort of a spirit of bipartisanship that will probably be gone next year, but sort of existed in the bubble of the lame duck. HAYES: I want to focus for a moment on the one big disappointment of this lame duck session, which is the Dream Act, which I remember being a reporter in 2003 and pitching a magazine feature on this thing, which has been around forever. States have passed it. It's one of these things, the moral logic of it seems fairly impeccable. Why did this not pass again? FINEMAN: Well, this is a case, I think, where some Democrats who were looking toward the next election made it difficult, Jon Tester from out West being one of them. He's a guy who the people who supported the Dream Act are really furious with right now, for example, from Montana. I think some people who are up on the Democratic side in 2012, who are very skittish about the immigration question, decided not to take a risk. I think they may be taking the wrong lesson or maybe not paying attention to what happened in Nevada. The Republicans went pedal to the metal on the fear strategy on immigration. It ended up sinking whatever the chances the Republicans had of winning that seat. Harry Reid won going away, but other Democrats out West, especially, and in the Southwest, didn't want to take that chance. I think that's a big reason why. HAYES: I think that's a good point about what the lesson is there. And I think long-term, you know, the political and policy interests align here. HAYES: So hopefully we're going to see something better next year. Final question here, I want you to tell me about what is the status quo on this spending continuing resolution. And how much of a doomsday scenario are we setting up for ourselves come March when this continuing resolution expires? 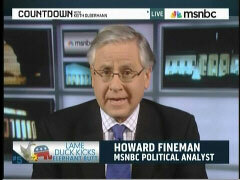 HAYES: MSNBC political analyst Howard Fineman, thanks a lot for your time tonight. Appreciate it.